Because of the morphological difference between unicellular bacteria or yeasts and apically-elongating, non-fragmenting, hyphal fungi, culture absorbance is a less reliable way of assessing the biomass of filamentous fungi than of bacteria or yeasts. Nevertheless, it is non-destructive and useful method for most growth experiments with fungi. Fig. 14 shows early growth of the ascomycete Geotrichum candidum in shake flask batch cultures; that is, cultures in a defined starting volume of liquid medium that were incubated on a shaking platform in a constant-temperature room. The parameters plotted introduce a number of features. Note that biomass was quantified both by measuring culture absorbance (or ‘turbidity’; open triangles in Fig. 14) and by subsequently drying the sample to determine dry weight (open circles in Fig. 14). The numerical values of these two measurements are obviously different, but the patterns of the curves that result are sufficiently similar for turbidity to be used as a reliable measure of biomass in such cultures of this organism. Fig. 14. Initial growth of the ascomycete Geotrichum candidum in shake flask batch cultures. The plots show the increase in dry weight (open square; mg ml-1, log scale), culture tubidity/absorbance (open triangle, log scale), total hyphal length (cross; μm ml-1 × 108, log scale) and number of hyphal tips ml-1 × 106 (open circle, log scale) of Geotrichum candidum in shake flask culture. 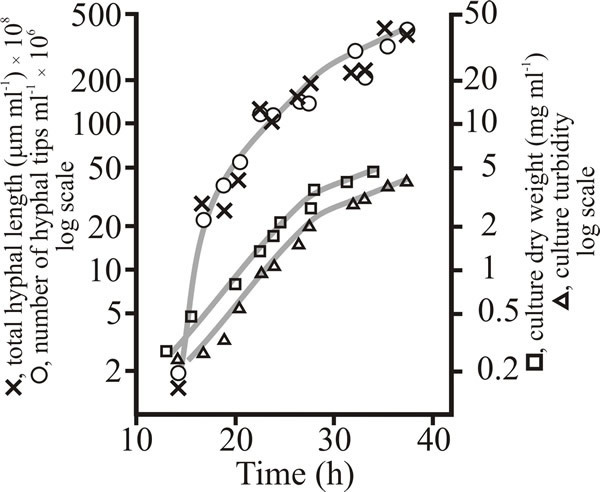 increase in culture absorbance is a reliable measure of increase in the total number of hyphal tips in the culture. Of course, having measurements of both total hyphal length and number of hyphal tips allows the former to be divided by the latter to calculate the length of the hyphal growth unit (G) (Table 6).